The 1998 Olympics in Nagano, Japan are excluded from the data set because the Japanese destroyed all the financial records–I’m guessing Nagano did not go especially well for Japan. Aside from that, what do we observe? Rich countries hosted the Olympics in ’94, ’96, ’00, ’02, ’06, ’10, and ’12. Developing countries hosted in ’04, ’08, and ’14. Three of the four most expensive Olympic games have taken place in developing countries, and the London games were under immense pressure to remain at least marginally competitive with the ’08 games in Beijing. 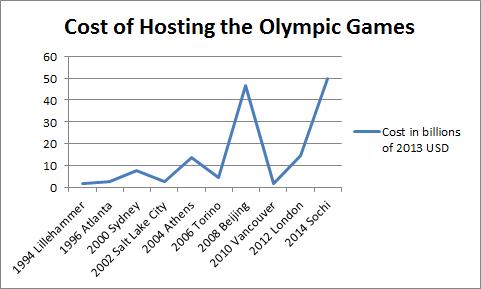 We observe a bouncing tendency–summer games generally cost more than winter games in part because revenues from summer games are usually higher, but this bouncing pattern has broken this year–for the first time, not only are the winter games more costly than the previous summer games, but the winter games are more expensive than any of the summer games that have been held. 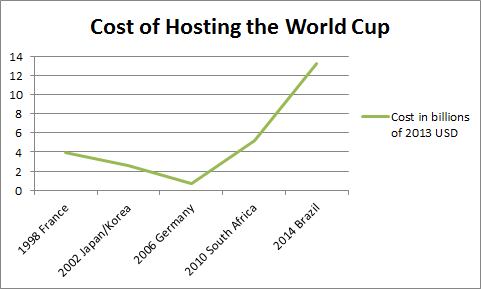 Rich countries were actually getting more efficient at hosting World Cups from ’98 to ’06, but as soon as developing countries got in on the action, the costs begin to skyrocket, with Brazil’s current estimates easily smashing records. By throwing more money at these events, developing countries not only drive up the expectations and costs for future host countries, but they do major harm to their own economies. Developing countries are far less capable of expending vast amounts of resources on luxury sporting events than rich countries are, yet they are the ones that spend the most. They are least capable both because developing countries by definition have less money and because the scale of social problems is greater in developing countries and the resources are needed more desperately elsewhere. Consider the recent turmoil in Brazil, where protesters have taken to the streets to the denounce the World Cup, the corruption it has invited, and the funds diverted from anti-poverty and development spending. Worse, these developing countries often cannot maintain or fill their stadiums after the sporting events have gone. South Africa and Brazil both have per capita GDPs of around $11,000, and inequality means that the majority have incomes below that level. These people cannot afford to buy expensive tickets to go to sporting events or concerts. In contrast, many US cities have stadiums for their professional teams that, if anything, are too small to service demand. Developing countries attempt to use sporting events to make statements about how developed the are instead of spending those funds on actually developing in the first place. In so doing, they demonstrate a terrifically immoral disregard for the interest of their large poor populations. They not only spend more in relative terms than their richer counterparts, they spend more in absolute terms. This kind of wastefulness is tolerated and indeed encouraged by organizations like FIFA and the International Olympic Committee, who actively seek to reward these events to the highest bidders, which tend to be corrupt regimes in developing states. Greece (.860), Russia (.788), Brazil (.730), China (.699), and South Africa (.629), would not have qualified. Nor would Qatar (.834), which is scheduled to host the World Cup in 2022 (Russia has it in 2018). The Olympics, to their credit, will play both the next summer and winter games in rich countries (South Korea in 2018, Japan in 2020). Some may rightly point out that this makes it impossible to bring these sporting events to certain regions of the world, at least in the medium term (Latin America, Africa, the Middle East, South and Central Asia). But this is because these countries are not yet ready to host these games–they still have vast numbers of desperately poor people that they have a responsibility to care for. The international community would do well to remind them of this fact, and politely decline their petitions to host, no matter how much money they volunteer to divert from welfare spending. If we were well and truly committed to finding a way to host these sporting events that would not divert funds from those in need (and there are people in need even in the highly developed countries I list), we would imitate the ancient Greeks by finding a single location in which to host these events every year in stadiums that we would proceed to reuse. If policy does not change, the cost of these events will continue to rise, pushed ever upward by the recklessly high bids of corrupt developing states who cannot in consistency with their moral duties to their citizens pony up the large sums of cash they claim they can. If they will not exercise restraint, the international community should do so on their behalf. Ah, to be young and … Why not the Gini index? or Trafficking in Persons Tier level? or…. The corrupting pressures may be too great for any meaningful change. Perhaps an effort to move “success” from political loyalty to investment ROI would be easier…..I think. I went with HDI because it combines health, education, and income, which I thought were diverse measurements that track living standards better than rote per capita GDP, though if I remembered rightly the UN does do a version of the index that also takes into account inequality. ROI to the host state would be a substantial improvement as the criterion for FIFA & the Olympic committee. Part of the trouble is that an organization like FIFA stands to profit from a host country’s excesses, thereby encouraging it to pick plans that harm hosts. Thanks for the insightful post on using HDI for consideration in choosing countries for major international sporting events. Why did you select the threshold of .87? What was magic about that number? Apologies for not getting to your comment earlier–it must have slipped through my notification cracks. There’s nothing special about .87, and I think it’s a figure that could be contested. I chose it because the UK, which I believe did a good job of hosting in 2012, is just over the threshold while Greece, which I believe did a poor job of hosting in 2004, is just below it. Thanks for sharing! Glad you liked the piece! Hi! I must have missed it–congratulations! Way to go!